The scheme of work is a 5 year scheme and runs from Year 7 to Year 11. Each set works through topics at an appropriate pace, enabling students to build on skills and understanding gained previously and reinforcing areas that they find difficult. Number: calculate with whole numbers, decimals, fractions, percentages, written and mental calculations, indices, surds and standard form. Algebra: equations, formulae, expressions, graphs, sequences, numerical solutions, algebraic proof. Geometry and measures: angles, perimeter, area, volume, properties of 2D and 3D shapes, transformations, trigonometry, Pythagoras’ Theorem, vectors, constructions and loci, congruence and similarity. Probability: probability of events, experimental probability, sample space diagrams, sets and combinations, mutually exclusive events. Statistics: statistical diagrams, data collecting and sampling, averages and spread. In Years 7 – 11, Maths classes are taught in ability sets. Most years have 2 bands with 5 sets in each. Setting means that the work is clearly directed at the appropriate level of ability for each student. This maximises for each student the understanding and the feeling that they “can do Maths”. Thus the enjoyment, competence and confidence of students are increased. On arrival in Year 7, students are placed into Maths sets using their Key Stage 2 Maths score. New students arriving at other times are placed in appropriate sets using information received from previous schools. Movement between sets is encouraged at all times but is always considered after internal examinations. The Subject Leader coordinates the changes with discussion between teachers and consideration is taken of classwork, homework and general attitude as well as examination result. All students are required to have pens, pencils, a ruler (a short 15cm one is adequate), eraser and a scientific calculator for every Maths lesson. The recommended calculator is the Casio fx85. A protractor and pair of compasses will be regularly needed throughout the year and students are advised to always have these items with them too. All working should be neatly shown in exercise books. Even when using a calculator the calculation carried out should be shown. All diagrams should be drawn with a ruler and pencil. Classwork in the front – each new topic has a heading followed by simple clear notes and examples and the student’s work on that topic. This work is usually be marked by the students in class. Homework in the back – This contains all written homework questions and is usually marked by the teacher. For every student in Years 7 to 11 there will be one homework task each week which will consist of a sheet, from a booklet, set on FROG. These sheets will be based on topics from the previous half term’s work and so are a vital form of consolidation and revision. The exception is year 11 students towards the end of the year who will move gradually towards past paper revision for homework. These tasks are to be completed in the back of the exercise book so that they are all in one place and make it easier to detect any problems with understanding. Students are expected to show all their working; answers alone are not acceptable. Students will be expected to complete corrections by the following week and again it is important that all working is shown. Students may also be set additional questions either as further consolidation or as extension questions. These homework booklets will usually be available in full at the start of each term and students are therefore able to print them off or download them should they choose to do so. This might prevent them having to go back to FROG every week to access the work. Internal examinations are set once a year. In addition, class teachers set tests at appropriate times in the year. Students are always be given notice of these exams and tests together with details of what is being tested. They are an important and useful indicator of a student’s progress and should be taken seriously. All students in year 11 take the Edexcel GCSE Mathematics Linear examination 1MA1. This will be at Higher (grades 9-4) or Foundation (grades 5-1) level. The examinations consist of 3 papers, two with and one without a calculator. More details are available from the Edexcel Website. Core Maths 1 and 2 and Statistics 1 are covered in year 12. Examinations are taken at the end of the year. No module includes coursework. All modules are equally weighted. Further Pure 1, Decision Maths 1 and Statistics 2 are studied in the Year 12. AS Further Maths involves studying these three modules. Mathematics makes a good combination with many other subjects and is a useful subject for many university courses. A-level Mathematics is needed for most degree courses in Computing, Economics, Engineering, Mathematics and Physics. It is often useful for degree courses in Accountancy, Business Studies, Chemistry and Medicine. 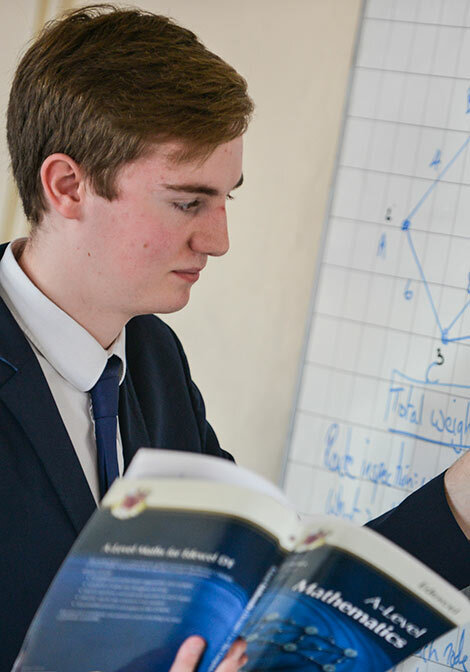 At either AS or A-level, Further Maths is often essential for anyone wanting to read Mathematics at University and can be very useful for other subjects for example Computer Science and Engineering. A GCSE of Grade C or above in Mathematics is needed for A-level Maths. A GCSE grade of A or A* is needed for A-level Further Maths. See the sixth form prospectus for more details.